Abstract: While judging their sensory environments, decision-makers seem to use the uncertainty about their choices to guide adjustments of their subsequent behaviour. One possible source of these behavioural adjustments is arousal: decision uncertainty might drive the brain’s arousal systems, which control global brain state and might thereby shape subsequent decision-making. Here, we measure pupil diameter, a proxy for central arousal state, in human observers performing a perceptual choice task of varying difficulty. Pupil dilation, after choice but before external feedback, reflects three hallmark signatures of decision uncertainty derived from a computational model. This increase in pupil-linked arousal boosts observers’ tendency to alternate their choice on the subsequent trial. We conclude that decision uncertainty drives rapid changes in pupil-linked arousal state, which shape the serial corre- lation structure of ongoing choice behaviour. Abstract: Decision-makers often arrive at different choices when faced with repeated presentations of the same evidence. Variability of behavior is commonly attributed to noise in the brain’s decision-making machinery. We hypothesized that phasic responses of brainstem arousal systems are a significant source of this variability. 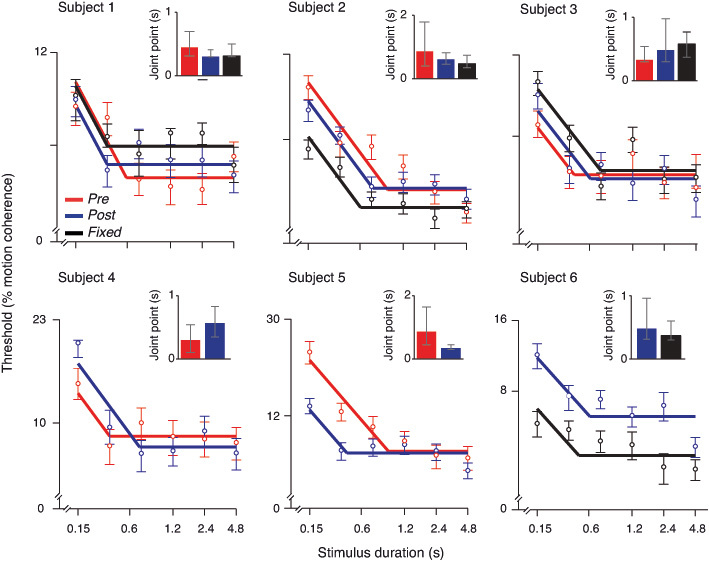 We tracked pupil responses (a proxy of phasic arousal) during sensory-motor decisions in humans, across different sensory modalities and task protocols. Large pupil responses generally predicted a reduction in decision bias. Using fMRI, we showed that the pupil-linked bias reduction was (i) accompanied by a modulation of choice-encoding pattern signals in parietal and prefrontal cortex and (ii) predicted by phasic, pupil-linked responses of a number of neuromodulatory brainstem centers involved in the control of cortical arousal state, including the noradrenergic locus coeruleus. We conclude that phasic arousal suppresses decision bias on a trial-by-trial basis, thus accounting for a significant component of the variability of choice behavior. Abstract: Perceptual decisions are based on the temporal integration of sensory evidence for different states of the outside world. The timescale of this integration process varies widely across behavioral contexts and individuals, and it is diagnostic for the underlying neural mechanisms. 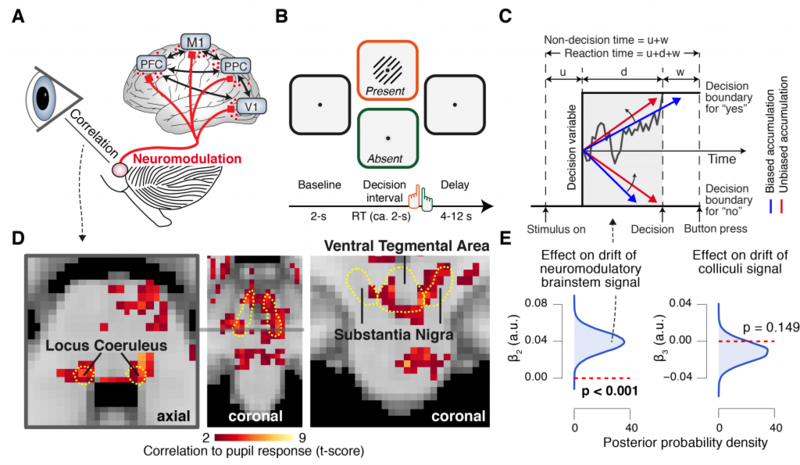 In many situations, the decision-maker knows the required mapping between per- ceptual evidence and motor response (henceforth termed ‚”sensory-motor contingency”) before decision formation. Here, the integrated evidence can be directly translated into a motor plan and, indeed, neural signatures of the integration process are evident as build-up activity in premotor brain regions. In other situations, however, the sensory-motor contin- gencies are unknown at the time of decision formation. We used behavioral psychophysics and computational modeling to test if knowledge about sensory-motor contingencies affects the timescale of perceptual evidence integration. We asked human observers to perform the same motion discrimination task, with or without trial-to-trial variations of the mapping between perceptual choice and motor response. When the mapping varied, it was either in- structed before or after the stimulus presentation. We quantified the timescale of evidence integration under these different sensory-motor mapping conditions by means of two approaches. First, we analyzed subjects’ discrimination threshold as a function of stimulus duration. Second, we fitted a dynamical decision-making model to subjects’ choice behavior. The results from both approaches indicated that observers (i) integrated motion information for several hundred ms, (ii) used a shorter than optimal integration timescale, and (iii) used the same integration timescale under all sensory-motor mappings. 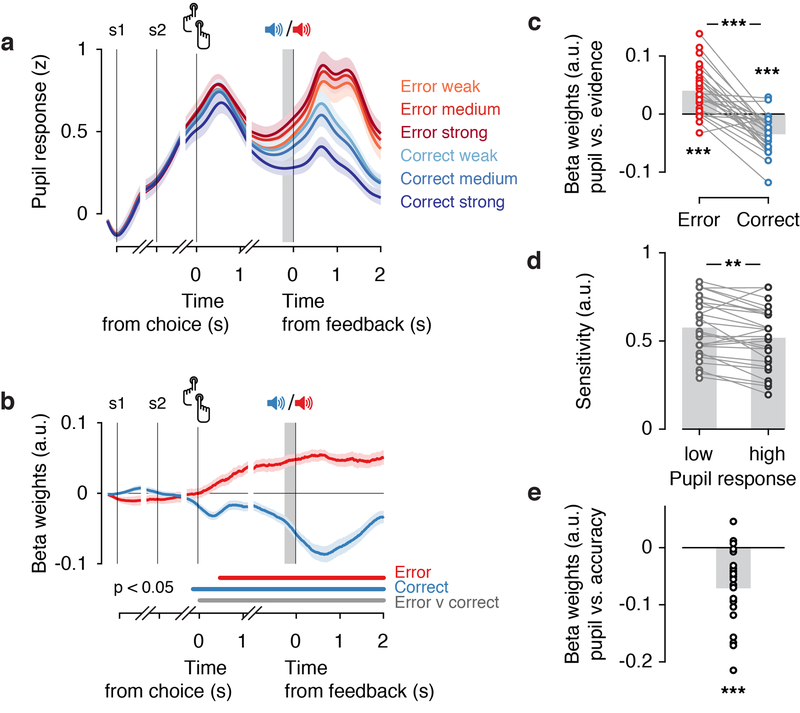 We conclude that the mechanisms limiting the timescale of perceptual decisions are largely independent from long-term learning (under fixed mapping) or rapid acquisition (under variable mapping) of sensory-motor contingencies. This conclusion has implications for neurophysiological and neuroimaging studies of perceptual decision-making.